I’ve been to the top of the Empire State Building, hollered at a baseball game and eaten my bodyweight in nachos while watching the Super Bowl. 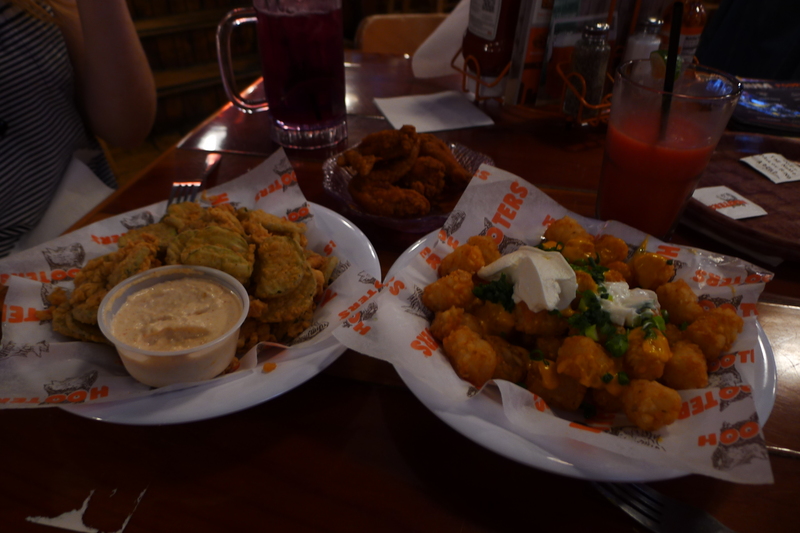 But there’s one American tradition that I’d avoided until tonight: Hooters. Elektra and I decided to pay a visit after walking past the chain’s New York spot in Midtown West last week. But as our date got closer, I started to feel more and more guilty about the prospect of giving money to an establishment like Hooters. Ahead of the trip, I couldn’t figure out who was exploiting whom – the guys for ogling at the girls, or the girls for knowing the guys would ogle at them and pay them big tips for the privilege. The whole thing made me feel uncomfortable, and yet I was intrigued to see if it was as awful as I imagined. The city’s Hooters is on 56th Street and 7th Avenue, where we were shown to our table by very made-up ladies with teeny tiny neon shorts and tanned tights. I was surprised to see a real mixed crowd – like any crowd in any restaurant chain: Groups of friends, mums out with their kids, a couple of hipster girls, guys having a beer. I was really surprised actually. Now. The Hooter Girls. While I’m as much of an admirer of lovely ladies as the next sane person, I didn’t feel comfortable even looking at the servers. I felt like a lech! I’d been told ahead of the visit that the girls weren’t that attractive – but whoever said that obviously did not get the same staff as us; these women may have been caked in make-up, but they were gorgeous and somehow worked those horrendous tanned tights. And they were polite, friendly and professional. Interestingly, rather than leering at the girls, I noticed that the men – especially those dining alone – were falling over themselves to be nice to them. It totally makes sense and yet I didn’t expect this at all. They were all reduced to goofy grins and pleasantries the minute they clocked those shorts. The food was as I expected – comforting and tasty, but not a vegetable in sight. 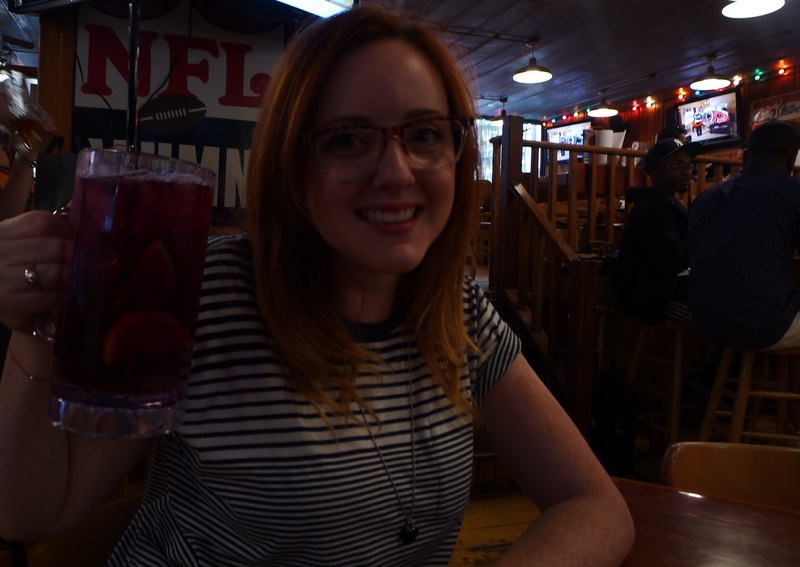 I drank a sugary sweet strawberry daiquiri, while Elektra swigged a vat of sangria. We ordered a few starters to share – tater tots, battered gherkins and the restaurant’s famous chicken wings (for Elektra, obv) – and that was by far enough. It was an absolute grease fest. The experience was much better than I’d imagined – the staff were sincerely friendly, the crowd was varied and it was a really relaxed place to have a good catch up with Elektra. But it goes without saying that the chain is swimming in sexism, and signs like ‘Hooters waitresses are flattery operated’ made me wanna hurl those tater tots right back up. 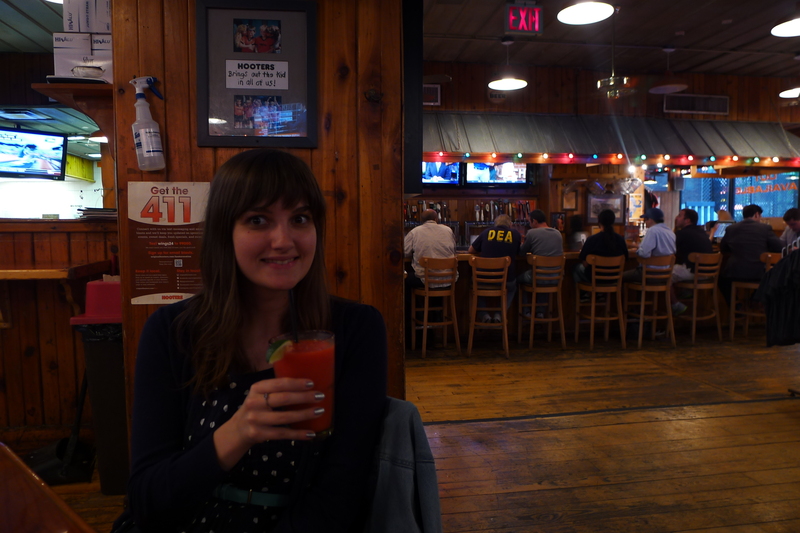 While I’ve found that I want to repeat many of the new experiences I’ve had while doing this blog, unsurprisingly heading back to Hooters isn’t one of them.